Add the shrimp, turmeric, lemon juice, and salt in bowl and marinate for about 1/2 hour at room temperature. Warm the oil in large skillet or a wok over medium-high heat. Remove the shrimp from the marinade and drain. Place in the skillet or wok in small batches so shrimp aren't touching each other. Cook until a charred crust forms on the bottom, then flip and repeat for the other side. Transfer the shrimp to a bowl and set aside. Continue the process until all the shrimp are cooked. NOTE: Because the ingredient list was so long, this recipe is done in 3 parts. 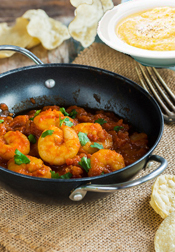 If you don't see all the parts, type Masala Shrimp into the search box on our home page and all three parts should appear.